The holidays can be very stressful time of year. 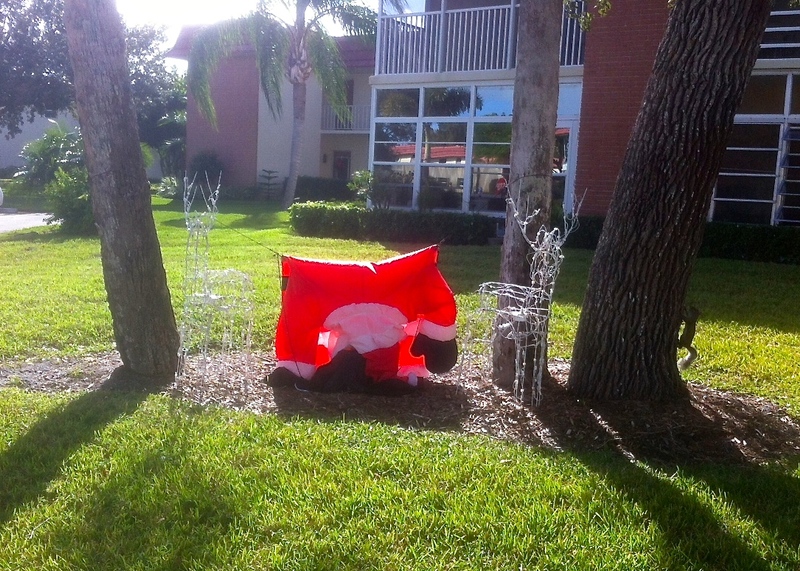 This is why I shouldn’t be too surprised that Santa has become a bit of a victim. I found him this morning outside his nearby condo (who knew?). I hate to be catty, but quite frankly he’s looked better. It is admittedly difficult to navigate the social protocols during the holiday season. We all do try not to offend someone’s feelings and/or make anyone’s holiday less than happy. A good friend of mine, bless her, was unsure about MY feelings earlier this week, and asked if it would be okay if she sent me a Christmas card even though I’m Jewish (Hi, H). Of course, I told her it was just fine. I do, however, suspect my evil twin “Skippy” might send her a Passover card next year at Easter just to play with her head a little. Family members are also ones who you sometimes have to tip-toe around for fear of offending. Another friend once bought his sister-in-law a gift certificate for a facial and full manicure at the salon next door to his own business. He thought it was a nice, generous gift until the poor woman took it to mean that she needed to be spruced up a bit. Oops. Even my own tribe hasn’t really figured out this time of year. Chanukah is in no way, shape, or form as important to Judaism as Christmas is to Christianity. It’s a celebration of a battle, and then the miracle of the oil keeping the sabbath candles lit over eight days. We celebrate the holiday by lighting the menorah each evening, kids spin the dreidel, and yes there are presents. When I was growing up, we would receive our presents usually on night of the first candle-lighting. It was always exciting, and I would be lying if I didn’t admit to hoping that I would get a cool gift that year. Every Jew I knew at the time celebrated in a similar fashion. But somewhere along the way, I’m guessing in the 1980’s, there began this new tradition of a present being given every day. Eight days of presents! I still scratch my head at that one. My favorite holiday story is when I was in high school and working at the nearby drug store as a stock boy. It was the day before Thanksgiving, and my dad came in to buy a newspaper. He joked around with the candy counter girls and then waved to me when he left. The young girl at the cash register wished him a happy Thanksgiving as he exited the store, and then proceeded to put her hand over her mouth in utter horror at what she had just said. The poor girl. We all poked fun at her for months afterwards. Yet, there she was, navigating the same social mores that we’re all still tripping over today. Fox News likes to crank up the decibel level this time of year with its annual stories on the “War on Christmas.” Apparently there are too many of us who say things like “Happy Holidays” or “Seasons Greetings” instead of Merry Christmas. I’m no expert on the media, but I’m wondering if their umbrage might be more about ratings and advertising dollars rather than Jesus. I nonetheless think there is hope for all of us during the season: It lies with the radio stations that change their formats to nothing but holiday music around the clock. I know of no one who actually likes this. All of my friends, Christian or not, complain about the incessant carols that invade their car radios and offices beginning right after Thanksgiving. Such is the lasting discomfort, that I’m pretty sure it even provokes one to switch to another station when Stairway to Heaven comes on till at least March or April. Perhaps on that score, we may have reached some consensus. I don’t want to appear as a kind of Scrooge. In a couple of weeks we’ll be lighting the menorah and putting up our “Happy Chanukah” streamer in the living room. We even went “commercial” this year and got one of those tacky electric menorahs to put in the window. When in doubt, go kitsch. The cable movie channels are all beginning to show Going My Way, Miracle on 34th Street, The Bells of St. Mary, and It’s a Wonderful Life. I love those films. And, I’m sure Gorgeous and I will drive around to some of the neighborhoods to look at decorated houses, both good and bad. There is always joy this time of year — you just have to find it, embrace it, and make it your own. Now, let’s see if I can’t do my own small part in helping Christmas this year. There’s an injector of Vitamin C somewhere around here, and I should go find my Santa neighbor to give him a boost of some kind. Merry… ‘er Seasons Greetings to all of you. Happy New Year to you and Gorgeous! Thank you, Sharon! You too!